Karen Didion Santa - "Lighted Woodland Santa"
Home > Karen Didion Originals - Santa and Elf Figurines > Karen Didion Santa - "Lighted Woodland Santa"
Beautiful collectible figurines that will be family keepsakes from generation to generation. These Santa figures have hand painted resin faces and hands with inset glass eyes and real mohair beards. Many exquisite and unique fabrics are used to make the Santa's clothing, such as; imported tapestry, velvet, jacquard knit, satin, velour, suede and leather. Novelty prints and designer buttons set off the vests and coats. Faux fur, embroidery, unusual braid and tassels are used as trims. The Santa bodies are fiberglass and weighted to be free-standing. 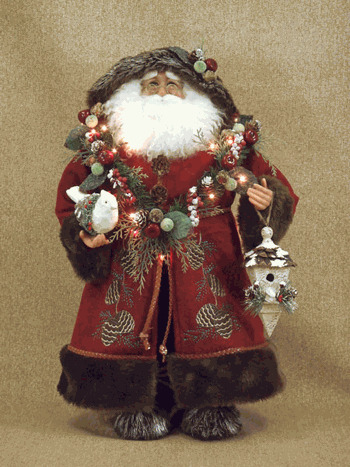 The decorative accessories are unique, many are created expressly to fit the style and theme of these precious Santas. All of the attention given to the details make these collectible Santas special to give as a gift or collect all year round.